Happy New Year! Have you made any resolutions? One of my resolutions last New Years was to do more of what I love and enjoy doing, including baking. I think I will keep with that again this year. With my boys home from school, we had fun baking a few things together including these Chocolate Whoopie Pies with Cream Cheese Filling. Ever since I made my first batch of whoopie pies my boys have been asking for more. My older son Travis and I decided to make the traditional chocolate variety. For the filling, we used cream cheese instead of the more traditional marshmallow filling. Travis especially enjoyed piping in the filling. He had never used a pastry bag before so it was a good way to practice. 1. Preheat oven to 350°F and lightly butter or spray whoopie pie pan with cooking spray.2. In a large bowl, beat butter and sugar until light and fluffy; add egg and vanilla and beat until well combined.3. In a separate bowl, sift together the flour, cocoa powder, baking soda, and salt.4. Alternate adding the dry ingredients and the buttermilk to the mixture and mix until combined.5. Using a scoop or a tablespoon, spoon 2 tablespoons of batter into each cavity and gently spread the batter to the edges of the cavity.6. Bake for 8 - 10 minutes or until the top of the cakes spring back when touched.7. Allow cakes to cool for 5 minutes in the pan; remove from pan and allow to cool completely before filling.8. To make the filling, cream together the cream cheese, butter and vanilla; sift in the powdered sugar and beat until smooth.9. 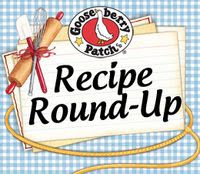 To assemble whoopie pies, spread or pipe filling on one cake and then top with another cake.10. Serve immediately or refrigerate and then bring to room temperature before serving. Beautiful.. now if only I hadn't started that diet yesterday. I LOVE cream cheese. I never liked the marshmallow stuff. What a fun thing to make with your boys! They look delicious! I was thinking I needed to bake something today with my son who is still off this week from school! I did whoopie pies today too, but I think yours are prettier!! Just gorgeous!! Beautiful! I know some recipes have Crisco in them and I just cannot do it. These look amazing with real ingredients. Lovely Whoopie pies! I still have yet to make some, but it is on my bucket list of desserts to make! Hope your New Year's weekend was wonderful! These look (and sound!) fantastic. Delicious, delicious recipe. My only resolution was to not make resolutions anymore! I just get so disappointed with myself when I don't follow through, and stress myself out with them. I could probably do with a baking a little less resolution though! This looks so good. Happy New Year! I don't make New Year’s resolutions. I just try to do good each day. Oh Jill, I TOTALLY see why your son was asking for more! Cream cheese filling?!?!?! Momma mia! Your pictures are so beautiful and sharp all the time. I've never made whoopie pies but I think it's time I get started. Great post. So much for my New Years diet resolution! :p These look pretty tasty! These are such cute delicious little pies! What a fun treat! These look delicious. Jill delicious Whoopie pies, I will make them after my delivery. Pasteles muy hermosos y delicioso relleno me encanta, estoy decidida a prepararlos abrazos y buen año hugs,hugs. Cream cheese filling with a soft cookie. YUM! These look heavenly! The cream cheese frosting just makes them perfect. These look lovely. I love the chocolate and cream cheese combination, that sounds so good. I just want to say "whoopie" when I look at these pies! They sound perfectly rich, and I love the cream cheese filling! My daughter can always anticipate what I'm going to suggest adding to something: cream cheese (sometimes sour cream or whipped cream...guess I just like cream!). Bet Travis had fun with this and enjoyed the results! Thanks! These sure do look delicious! I think I like the cream cheese filling better, too! Very nicely done! I love anything with a cream cheese filling. I've also got a new piping bag so will be now trying to think of something I can use cream cheese on! The cookie/cake part looks so chocolatey and rich. In addition the filling is a great complimentary flavor. Delicious creation-yum! Jill Happy New Year!-Your Whoopie pies look great, and especially because your son and you made them together, I used to bake and cook with my boys when they were little, and you are making memories. These are on my to bake list for 2012!!! Mmmmmmm....my kids have been asking for more whoopie pies, too! Yours look absolutely perfect, Jill! Thats lovely looking and that cream cheese filling is simply yummy, what more with the lovely pics. 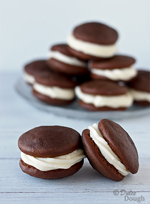 What's not to love about a Whoopie Pie - and yours look delicious! I haven't made any since Halloween so I think it's time to make a batch. I love chocolate and cream cheese so these are right up my alley. Thanks for sharing and Happy New Year! Would you believe I never tasted a WP and these really are making me want some. MY New Year's resolution is to bake and I just did my first cake. I must buy baking pans as my collection is very limited. I bought a whoopie pie pan and have yet to use it, these have made me see the error of my ways. How did you know I have a secret crush on cream cheese? Happy New Years! Gorgeous photos, and amazing super delicious whoopie pies, with the yummy cream cheese filling, Jill! Totally drooling here...can't have any of this for a while WW diet! Love whoppies thx for the recipe! I didn't know such a thing existed as a whoopie pie pan!